Happy New Year! I hope you all enjoyed ringing in the new year! We did not intend to stay up until midnight but we ended up reading, writing, and watching several humorous episodes of Jeeves and Wooster and The Big Bang Theory. I came away thinking, as I always do, that I need a Jeeves in my life. An immaculately dressed British valet doing all my housekeeping and fixing everything I mess up? Where can I get one? Can I get one that comes with a blue police box? Anyway, now that I've wandered off into nerd-dom and probably lost half of you, I want to bring up one of my favorite things to do for the new year. Every year, I pick a Word of the Year. A Word of the Year is a goal of sorts. It is a word to define one's hope for, and approach to, life in the coming year. I started doing it a few years ago after I started blogging and saw all the cool bloggers doing it. Cool bloggers pick a Word of the Year. I'm cool and I'm a blogger. That makes me a cool blogger too which means I can pick a Word of the Year. Something like that. In 2014, I picked organize, and (halfway through) 2015 I picked discard. This year, I picked the word deliberate. 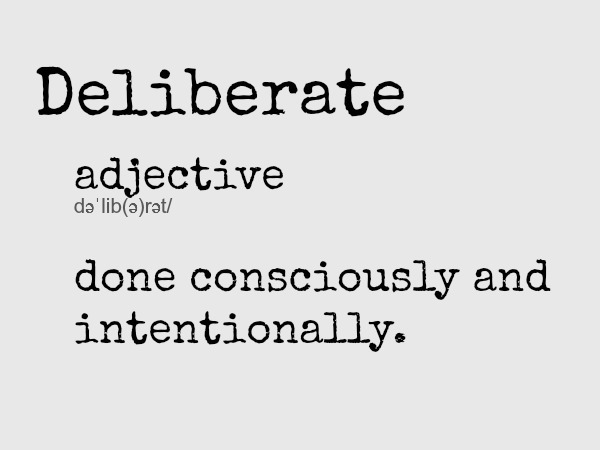 Hubby and I were having a discussion and he used the word deliberate and it jumped out at me. I had been trying to decide on a word and deliberate fit exactly. I feel that deliberateness has been lacking in my approach to life, the house, the blog, and my relationships. This year I want to be deliberate in my actions. I want to think ahead a little better and keep my long-term goals in mind. I need to be more deliberate in my relationship with God, connecting with people, in teaching and disciplining the boys, in loving my husband, and even in my approach to improving our home. I don't do resolutions but I have found choosing one word for the year to be helpful in helping myself focus. Do you usually do resolutions or a word of the year? Feel free to share some of your goals in the comments!